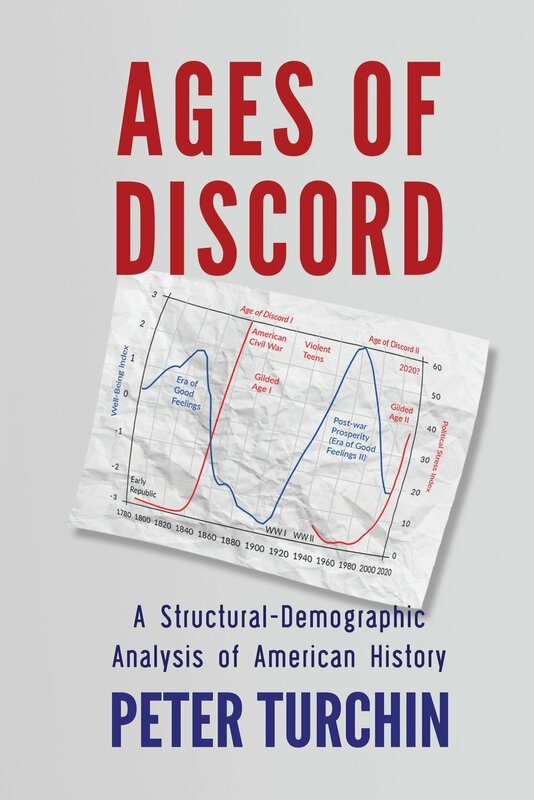 Book: Ages of Discord: A Structural-Demographic Analysis of American History (2016), 300 pages. Analysis by my colleagues and me of historical states show that complex, large-scale human societies tend to go through cycles of alternating integrative and disintegrative phases. Long period of relative equality, prosperity, and internal peace are succeeded by periods of inequality, immiseration, and political instability, frequently ending in state collapses, revolutions, and civil wars. He notes that there are two general cycles at work. First is a century long cycle between political instability interspersed with relatively stable periods. Within this cycle, however, there is another shorter cycle of 50 years. Or, as some of you may have noted, shorter cycles of 2 generations within an overall cycle of 4 generations. The overall cycle of both stable (intergrative) and unstable (disintegrative) is a century or longer, and, looking at other nations from history, can be two or three centuries. Although the exact formulation differs somewhat between pre-industrial societies and industrial societies, Turchin largely looks at two principle factors: (1) labor oversupply and (2) elite overproduction. Labor oversupply is simply whether the supply of labor exceeds the demand. An under-supply of labor generally leads to higher real wages, higher standards of living for the non-elites, but requires elites to share a larger share of the economic pie with non-elites. Conversely, an over-supply of labor results in lower wages, depressing the living standards for the majority of the population and resulting in popular immiseration, while creating favorable economic conditions for the elites. Favorable economic conditions for elites (generally marked by increased wealth and income disparity) result in an increasing number of elites and elite aspirants, as well as an increase in elite consumption levels. Per Turchin, "[e]lite overproduction results when elite numbers and appetites exceed the ability of society to sustain them, leading to spiraling intraelite competition and conflict." A democratic system of government may allow for nonviolent rotation of political elites, but ultimately this depends on the willingness of some segments of established elites and/or elite aspirants to give up their elite positions and status. Thus, elite overproduction increases the probability of violent intraelite conflict. One common response by the established elites under these conditions is to close ranks and exclude other elite aspirants from power, which causes the latter to organize as counter-elites. Turchin notes that "one common tactic employed by the counter-elites is to mobilize the masses against the established elites, something made possible by deep-running popular discontent." Turchin observes that popular-uprisings, by themselves, are rarely successful unless they have support of a faction of the elite; and popular uprisings will fail if the elites unify to oppose them. In this regard, Turchin advances the claim that the Civil War was primarily an intraelite conflict between elite and elite aspirants in the North East wresting power from the Southerners that had long dominated American politics. Popular immiseration is second in importance because it can either frighten (and unite) the elites, or provide the cannon fodder needed for intraelite conflict. Fiscal crises is the least important, and may even be absent in some cases, when civil unrest peaks. Turchin's book is interesting because of the various anti-immigration themes that crop up in his book. For instance, the two great periods of improving living standards--essentially post Revolution to about 1840, and post 1920 to about 1970, were marked by strong restrictions on immigration that served to increase real wages and higher standards of living. Conversely, the two great periods of immigration, from about 1840 to 1920 and since 1970, have seen labor oversupply, falling or stagnant living standards for the majority of Americans. Turchin, in fact, notes that the only living standard that has not been falling over the last few decades is life expectancy--even average population height has been decreasing. But even as to life expectency, although missed by Turchin, the life expectancy of white men have declined recently. Turchin also discusses cultural traits that might dampen social unrest, such as the capability of intragroup cooperation. "[O]ne set of social norms is willingness to cooperate with other interest groups for the sake of the common good, readiness to compromise, and generalized trust that the authorities and social institutions will 'do the right thing'." The alternative to this, he writes, "is pervasive social distruct, unwillingness to compromise, and resolve to advance the partisan goals of one's interest group." Turchin makes two observations that are important to the immigration issue in this context. First, intragroup conflict is less violent than intergroup conflict. Second, "[c]ultural dissimilarity within a group, by contrast, tends to decrease the capacity for within-group cooperation." Third, "competition within groups also has a corrosive effect on the tendency of the group to generate and sustain collective action." Looking to our time, we are in a period that Turchin refers to as the Second Gilded Age. Life the "Gilded Age" of the late 19th and early 20th Century, the labor supply has outgrown the labor demand due to various factors such as increased immigration (the number of immigrants as a percentage of the population is now the greatest it has ever been), the flow of women into the workforce, and the loss of jobs overseas. The result is that the income and wealth of the elites has grown, and income and wealth disparity is at a near time high as well. Today's tech oligarchs sit in the same position as the "Robber Barons" of the late 19th Century. As noted, all measures of well-being for the average American has stagnated or declined since the 1970s. On top of this, there are signs of elite overproduction. Turchin uses several proxies for determining this, but a few are the increased costs of higher education, decreased openings for medical internships and residencies, and stagnant or declining salaries (in real dollars) for the majority of attorneys (the exception being a small number at the highest end of the scale). Although this post-dates Turchin book, I see the recent lawsuits against Harvard on admissions of Asians as another measure of elite overproduction and intraelite conflict. Essentially, these immigrant groups have spawned their own elite aspirants that are being stymied by the limited number of slots at the Ivy League schools that act as gateways to the ruling class. And looking through the lens Turchin offers, I would say that there are other signs of intraelite conflict. Frankly, the Trump presidency was the result of certain elites using popular discontent to make a bid for power; and the severe opposition offered by the Democrats is a rearguard action to stave off the loss of power. But the Democrat elites face a greater threat, in my opinion, from their own side because the special interest groups that have fallen under the Democratic umbrella are now fighting for their chance at the highest leadership positions. Turchin's theory predicts another crises heading into 2020 and the years immediately following. So far, popular discontent is not as bad as the pre-Civil War period according to Turchin--but he made his analysis in 2015 or 2016, prior to the 2016 election. While Turchin states both at the beginning and conclusion that he hopes his analysis helps avert future civil unrest, he does not expressly offer any suggestions. Implicit, as I noted above, is that the key to resolving the current period of instability would be to stop immigration, deport illegals, and return manufacturing jobs to the U.S. in order to put upward pressure on real wages. However, this would require the elites to give up a chunk of their profits and wealth, as occurred in the period 1930 to 1970, which they are, naturally, disinclined to do. In fact, it was only because of the threat from massive labor unrest, terrorism and communist revolution that the elites were frightened enough to curb immigration in the 1920s and agree to labor reforms. All in all Turchin offers an interesting model and analytical tool. The majority of the book is an attempt to explain and defend his model, and between the mathematics and historical analysis, one would expect the book to be somewhat dry. But I was pleasantly surprised to find that it was actually an enjoyable read that went pretty quickly.